Cheddar Cheese powder will add the delicious taste of cheddar to your snacks. This powder is perfect for sprinkling on popcorn, pretzels or any snack you desire. 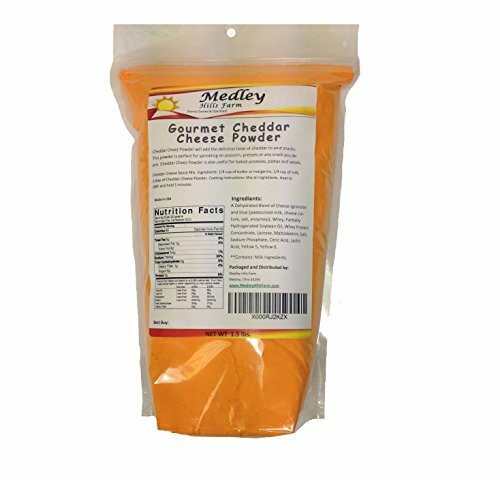 Cheddar Cheez powder is also useful for baked potatoes, pastas and salads. 1.5 lbs. Packaged in Sealed / Resealable Ziploc Bag . High Quality Powdered Cheddar Cheese, Sprinkle on your favorite popcorn, vegetables, and casseroles. Add the delicious taste of cheddar cheese to your snacks with this Cheddar cheese powder.